If you feel that getting to your ideal body image it is going to be a huge struggle, it will be all too easy to give up. The secret is to give yourself short- term goals as this will seem a lot less of a struggle. As you become familiar with your new thoughts and behaviours you can then set new goals, until you reach a happy and healthy weight for you. Think like a winner! Affirmations can prove to be extremely powerful and effective. 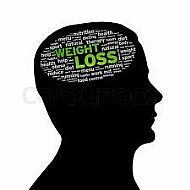 In ‘Forget the Fear of Food’ weight loss expert Dr Christine Fenn recommends you affirm ‘I am feeling fit and healthy’ then imagine yourself exactly like that, regularly throughout the day. Visualise the clothes you are wearing and how good you look in them. Notice how healthy your hair is, the glow of your skin, and the sparkle in your eyes. Feel the health and the strength in your body and notice how you stand tall and confident in the body of the new you. Set yourself short-term goals. Due to our human survival instinct we seek pleasure and avoid pain. If we associate more pain with dieting than pleasure we will instinctually fail miserably. When we set ourselves short-term goals and then we reach them, we get high (not through illegal substances), a natural high. Our body recognises this as pleasure and from this we see everything more clearly and positively. Think about what you eat and why you’re eating it. Is it because you're really hungry for food, or are you fulfilling an emotional need? Learn to love and appreciate yourself. Last of all good luck and remember the key to happiness is having dreams… the key to success is making dreams come true.